UFC News: What Happens To Fans Who Bought Tickets To UFC 232 In Vegas? The highly sought after UFC 232 event, initially set to take place at the T-Mobile Arena in Las Vegas, has now been relocated to a different venue. The Forum in Inglewood, Los Angeles, California, will now be hosting the event, leaving fight fans across the world confused about matters regarding ticket bookings and other reservations. Following a drug screening performed on former UFC light heavyweight champion, Jon Jones, earlier this month, there has been immense chaos that has tagged along. Jones was found to have shown a positive result for trace amounts of Chlorodehydromethyltestosterone (DHCMT), or Turinabol, which has raised suspicion once again within the MMA community. The Nevada State Athletic Commission denied Jones from permission to compete in the UFC 232 fight card, as a result of this test. The venue has since, been moved, to the state of California, where the state's athletic commission sanctioned the fight based on the following statement released by the United States Anti-Doping Agency. After news about Jon Jones' drug test matter circulated across all social media forums, president of the UFC, Dana White, decided to weigh in on the situation. Some sources have claimed that ticket refunds will be available, but the extent of legitimacy in the matter is still unknown. Damon Martin, from the UFC, was the first to report on this situation. Dana White says tickets for UFC 232 in LA will go on sale Wednesday and folks who bought tickets in Vegas can get a full refund or they will try to accommodate new seats for people willing to travel to Los Angeles. Yeah, I spoke with AXS and effectively there will be no seat accommodation, everyone has to buy new tickets for UFC 232. 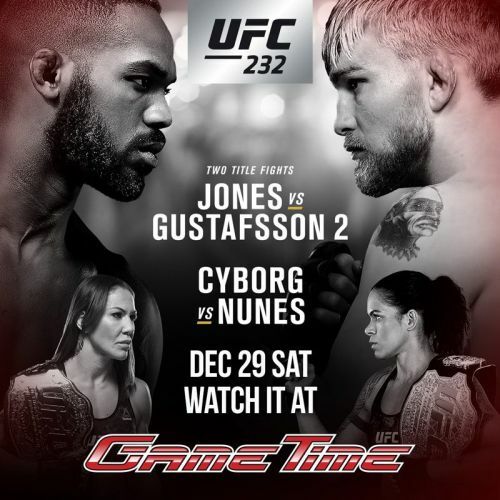 UFC 232 will take place on December 29th, 2018, and regardless of the state of affairs of the event, fight fans can be sure to expect a great deal of entertainment. Do you think Jon Jones should be removed from the card, to ensure that the remaining twelve fights for the event stay at the T-Mobile Arena in Las Vegas?